Awww, that is so cool. 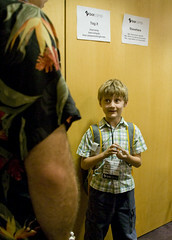 I wish my dad took me to a BarCamp when I was a kid. Of course we never had BarCamps back then… Hmmm. He looks alternately excited and terrified. Though he does look like he’s having more fun than the time my kid sat through a PRD review on take your kid to work day :). Glad he enjoyed it. It was great having Max there and so enthusiastic. Like you said I hardly knew he was there since he was so well behaved. You guys could also talk on what it took to-do the 20 X 2 video or have him do another one. Good luck Max and I hope to see you again at BarCamp DC or even a Refresh DC meeting. Max brings back pleasant memories of hacking in GW, Apple, and Quick BASIC as well as Logo and some C when I was about 7 … it’s good to see kids programming; It would be neat if you (or him) wrote a bit about it. I expect that frustrations have changed a bit; I spent time dealing with graphics and mouse drivers that just aren’t necessary today. On the other hand, I had trouble with some adults and my father. The latter felt that C was “too hard” for a child and wanted me to learn Turbo Pascal, which I couldn’t see anything fun that I could do with it. Kevin, thanks for coming out to BarCamp DC. It was so exciting to see the community come together in a big way. I really hope that we can keep the excitement going. Thanks for bringing Max along. It brought back memories of when I’d go with my dad to a lot of his work things. I remember it was always amazing to get exposed to those new experiences and get to do it with my dad. We all should be nice to Max because God knows he’ll probably be the one that we all work for in the future. He’ll run the Facebook of Web 4.0. We all kind of looked like that. Max was marvelous. Congratulations to him, and to you and Jen for doing such a great job with him. Let us know when he’ll be presenting at one of these things – I’d be glad to listen to what he has to say.